→How to monetize mobile traffic without hurting your SEO! Here is a smart way to monetize mobile traffic! A significant portion of the traffic to your blog comes from mobile devices these days. That’s because of the rapid growth in mobile technology and the portability and ease of use of mobile phones. People are always on the move so this somewhat justifies the increasing use of portable devices on the net. If you are monetizing your blog and not paying attention to your audience on mobile, you probably are leaving out a huge portion of your market. In today’s post, I want to discuss how to get into this untapped phase of the market and stand a chance of making even more money with your blog. According to Google Analytics, mobile traffic to one of my blogs in the month of September 2015 accounted for close to 50% of total traffic. This makes a lot of sense to me trying to implement any mobile traffic monetizing method. Unfortunately, most Affiliate Marketing platforms offer a mobile monetizing model that turns your SEO against your effort. You signup to their platform, grab a piece of code and paste on your blog. Once mobile traffic hits your blog, the visitors automatically are redirected to a landing page where they are expected to carry out some action before finally being taking to the destination url. This is an SEO problem as search engines are treating the redirecting of mobile users with severity. So how do you monetize your mobile traffic without risk of being penalized by search engines? Recently, I came across Propeller Ads and have been studying how their mobile traffic monetizing technology works. I think it’s something you’ll have to try to implement after reading this post. First, signup to propellerads.com here. It’s absolutely free. The second step is you’ll have to add your side to the platform. Note that the domain name on which the ads will run has to be approved. Once you are approved by platform administrators, it’s time to grab the code and paste on your blog. This is another simple process. From the screenshot above, you clearly can see different ad sizes to monetize desktop traffic and of course, two ad formats for the monetizing of mobile visitors. Once you choose the Mobile Advertising Ad Type, click the ‘Next’ button and follow on-screen instructions. How does Mobile Advertising work? Now, we saw earlier that there are two ad formats to monetize mobile traffic. Let’s examine these and discover how they don’t redirect visitors, making our blog Google compliant. This is a universal advertising format which fits on any mobile device. It pops up a systematic notification with buttons for proceeding to the advertiser’s offer or for closing. The Dialog Ads/Push Up works on all mobile devices running on any Mobile Operating system. This is simply a full-screen premium banner, displayed horizontally or vertically depending on the orientation of the mobile device’s display. With an X button top left of the ad, it makes it easy for the visitor to close the ad without getting distracted. Once the code is added to your site, the advertisement will start to work! You do not need a mobile version of the site for this. Case Study – Propeller Ads don’t have negative impact on your SEO! A case study on two popular ads proved that running Propeller mobile ads on your blog don’t have a negative impact on your site’s natural traffic. 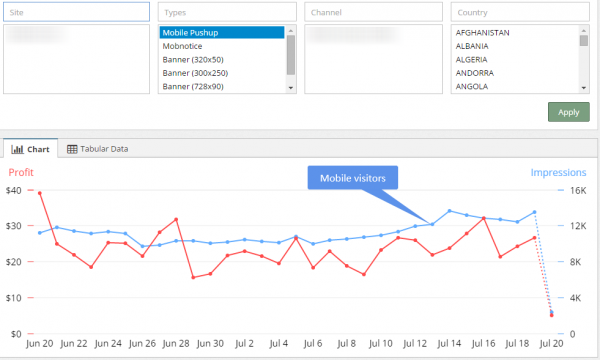 This study was done on two sites with a huge portion of their traffic coming from Google. For 30 days, it was clearly demonstrated that monetizing your mobile traffic with Propeller is safe. -> Mobile Dialog Ads, 30 last days stats! Once you sign up and want these additional options, contact your account manager who can also give you recommendations on the efficient use of ad units for your site. This has been a major concern on most Internet Marketing platforms. While most have just the option of paying earnings to Paypal, (making it quite difficult for International Marketers and bloggers to be part of their network) Propeller Ads spreads it across different payment options including the rapidly growing Payoneer. Now, Google’s Mobile First approach obliges every website owner to think mobile. That means any tool to help monetize mobile traffic should be a great addition. If you are getting mobile traffic, you should be able to give this tool a try. However, remember that while it’s exciting to generate more income on your site, your readers should come first. Drop a comment and let me know if you’ve used this platform before. Let me also know more about your mobile traffic. Very good blog about monetizing mobile traffic. I am using it for a long time. Many bloggers don’t know how they can use the mobile traffic. Now you made the gates open for them to earn more money. Nice review.. I used Propeller in one of my niche site and it works wonder..
90% of my traffic is from mobile. Unfortunately i do not know how to monetize is. I am making very little with thousands of visits per week. I have tried these ads but the script is not working in the blogspot’s tag. However it is working individually if placed in blog’s template with the help of adding Widget. Google has taken mobile responsiveness as a major factor in a site rankings and its a good thing you are showing us a platform that is mobile friendly. I’ve not started getting much trafic on my blog so I don’t know if I should dive in to try it out. I hope you soon start getting mobile traffic so as to take advantage of these tools. Thanks for stopping by at my blog. I appreciate it. As soon as I do, I’ll take advantage of this. Will be bookmarking for reference purpose. You are right about the spike in mobile device traffic. Your suggestion of using propeller ads is a good one. I am not crazy about adding ads to my site just yet but will definitely consider propeller ads when I do make that decision. Another concern of internet marketers is the eCPM. I do hope propeller ads has good rates? Good to see you here and thanks for the feedback. I’ll run it on my blog for a couple weeks to get these eCPM and other details. My 75% Traffic from Mobile Platform and I was worried that how can I utilize this traffic. My problem has been solved now. I have never heard about Propeller ads. Thanks for sharing another way to earn money. Will try soon on my niche site and share my experience. This is a very lovely review of Propeller ads. Monetizing a the mobile traffic of a blog can really be very rewarding especially when such blogs gets lots of mobile visitors. I’ve heard about the propeller ad network before but didn’t really took the time to check it out but from your post, it seems to be worth trying. Let me go check out the link at once. Honestly i was not aware about the importance of mobile traffic! It seems i am missing a great opportunity! Very detailed article you shared with us. Most thanks for recommending Propeller Ads as you have good experience on it. Thanks again for useful post. A major portion i.e 59% of total traffic to my site is from mobile devices and I was unable to monetoze my blog for that traffic. I am not making even a single penny from mobile traffic. Its just an Increase in pageviews. But propeller ads seems to be a good alternative to monetize my blog for mobile traffic. If you tell me what is the minimum payment threshold for propeller. Thanks for such Informative guide . On GuestCrew we receive 72% of our traffic from CellPhones and additionally another 4%+ from tablets. There’s no way we can ignore the cell phone traffic anymore, and this is long term data being measured for over a year’s time now! I have heard about PropellerAds but haven’t really looked into it. Thank you for the review, will check further into it. in Germany there is not a lot of traffic on mobile websites. I think, the costs of a mobile are higher than in USA. The german kids are only at Facebook and What´s up, they don´t go to other sites. I heard a lot of this network, but still afraid it will hurt the site with these kinds of ads. Good to know about this strategy, Thank you Enstine. I get lot of mobile trafic on my blog but i’ve heard that Propeller ads has very low cpm. so i want to know if i can use both Propeller ads and adsense ads on the same page. It depends on your traffic. If all of your visitors came from United States, Europe and Canada you can earn more than $7 per CPm’s. That is what the experience of some of my friends using Propeller ads. This is some serious stuff and I’m thankful that you published it. I still have few doubts. First, Google doesn’t allow putting full-screen advertisements on websites in desktop mode, so what’s it’s take on the mobile ads? I think it is against AdSense policies, although, not sure! Second, the advertisements which offer some offer and ask users to click on triggered buttons (CTA), always hurt the experience Because these are the advertisements we usually find on Software Donwload Sites, and most of the times they offer spam offers. So, how is it going to maintain the user experience at last? The study shown is valuable, of course, but what about these issues? Thanks again for sharing it! Good day. Well well propeller ads is growing indeed.I first used propeller some time back after i stumbled upon it somewhere but i have never considered mobile ads ,lemme check them out .This one seems great,thanks Enstine as always. Great info from you as usual. I have never had about propeller ads but I noticed their dialogue on your site. Thanks for sharing. I have tried this ad network.. In Indian traffic there is very low cpm. May be you know that very soon google adsense also providing some sticky ad to bottom in google adsense. According to me already some google adsense account already using this function is started now and slowly google rolling to all accounts. Let’s See google adsense team slowly improving their service for mobile traffic..
Hi Enstine Good day to you, though it’s my first time hearing about Propeller Ads but nothing is as popular as the adsense ads for now but still I would try this out. Thanks for sharing. Nice article here. Though I have never heard of propeller ads but the most interesting part is that it does not affect SEO. it been long since I visit your blog but I found your post quite great as usual but this one I cannot even overlook. Thank you so much for an amazing article, i was not aware of Propeller Ads but now i think this is the best way to monetize mobile traffic using Propeller Ads. I am very happy to read about the proper monetization method for mobile users. I own a blog which gets 80% of the traffic from mobile users. I will definitely try the Propeller ads advertisements on my blog. Hi Enstine, it’s my first time hearing about this Propeller Ads and I think of signing up to give a trial. Just use to notice some notifications like popupa on your website which I don’t know its an ad but now I understood. propellerads.com, something new to try, pretty high CPM for US/Canada/EU traffic. But is there any eligibility criteria ? I’m learning more about mobile as I snag more mobile traffic. Makes sense, right? Different set of rules for mobile users because of their different experience. I like checking my blog on my tablet for Android and on my friend’s iPhones and iPads to see what I’m dealing with. Or what they’re dealing with. Thanks much for sharing these tips. Question; isn’t there a site online where we can see how our blogs look on mobile devices? You should mention about the Mobile Interstitial ads from PropellerAds is a CPA method, not CPC. I have try this and also ask PropellerAds, they said it’s a CPA and only pay to you if you generate a lead. I was unaware about how we could monetize our mobile traffic with Propeller Ads. Currently i am fully dependent upon Adsense and yes i too agree with your point of view that mobile traffic is increasing day by day. I would love to give it a try but i have some queries on which i need to research upon, like is it safe to add Propeller ads along side with Google Adsense ads. What about the user experience with these ads on small screen . Thanks for sharing your experience with Propeller Ads. Amazing one indeed. I am glad to know that I can monetize my traffic with propeller ads without hurting the organics. Its a big big plus man. The 70% of my web traffic is mobile traffic. And I used to find it hard to balance the monetization on platforms. If I use it, is it good to use with Google ADsense? I am still in doubt. Its been 2 years using propellerads, I am very much satisfied. No drop down traffic yet. Using popunder and dialog ads. Looking forward to join this ad network. Hope it works fine even now.